by kathyregini | Comments Off on Move or Remodel? 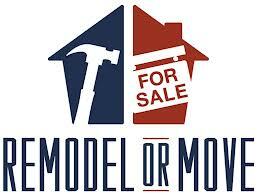 Are you not loving your house and having a difficult time deciding whether to move or just do a little remodeling? You might compare the cost of moving to remodeling. Moving is more expensive than you might think. Usually it involves a 6% commission on the sale of your house, plus another 2-5% for closing, movers, and related costs such as staging. If you really like your current neighborhood, and you think 10% of your home’s value would cover the renovations you would want- you might decide to stay. First, it’s important to get a cost estimate from a contractor (then add 10%), and find out if the improvements will add to the home’s value (will you get that money back if you eventually sell). With this approach, you probably won’t run the risk of over improving your property. You do have the remodeling hassle to deal with, but moving is no picnic either.